private balcony, bathroom, and all up-to-date facilities such as air-condition, Satellite TV, radio-music, direct-dial phone, wi-fi coverage in all room balconies, mini-fridge, Kattle,coffee and tea facilities, Espesso machine, Iron and iron board available, hair-dryer, Extra bed for children and baby cot available, and private safety deposit box. Double rooms sleep up to 3 adults. Standard double-bedded rooms plus bunk beds for the children or two twin rooms with an interconnecting door. Double for Single Use (Side Sea View) – Capacity: 1 adult. Ideal for Singles or Single Parent. Furnished Balcony with Side Sea View, Bathroom, Electric Kettle, Mini Fridge, Safety Deposit Box, Sat TV with radio stations, Telephone, Hairdryer. 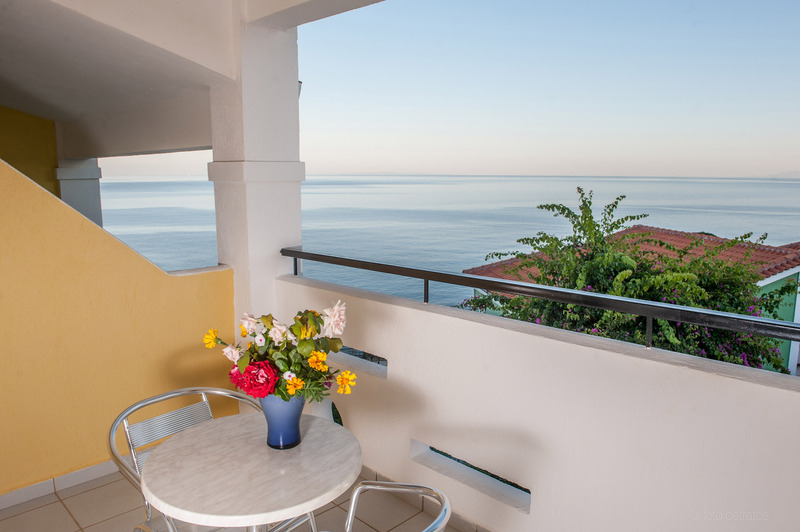 Furnished Balcony with Full Sea View, Bathroom, Electric Kettle, Mini Fridge, Safety Deposit Box, Sat TV with radio stations, Radio, Telephone, Hairdryer. Double Bedded, Large Veranda, Wedding Decoration, Free Sparkling Wine and Fruits on Arrival, Furnished Balcony with Full Sea View, Bathroom, Electric Kettle, Mini Fridge, Safety Deposit Box, Sat TV with radio stations, Telephone, Hairdryer. Double Bedded Room Plus one proper single Bed or Bunk Beds, Furnished Balcony with Side Sea View, Bathroom, Electric Kettle, Mini Fridge, Safety Deposit Box, Sat TV with radio stations, Telephone, Hairdryer. Double Bedded Room with Bunk Beds for the Children, Furnished Balcony with Side Sea View, Bathroom, Electric Kettle, Mini Fridge, Safety Deposit Box, Sat TV with radio stations, Telephone, Hairdryer. Studio with two bedrooms Side Sea View. First Bedroom with a children’s’ Bunk Bed and a Kitchenette, Second Bedroom double bedded for the parents. Furnished Balcony with Side Sea View, Bathroom, Electric Kettle, Mini Fridge, Safety Deposit Box, Sat TV with radio stations, Telephone, Hairdryer. Side Sea View. Minimum Capacity: 4 proper beds plus to extra camp beds or baby cot instead. Minimum charge: 4 adults. 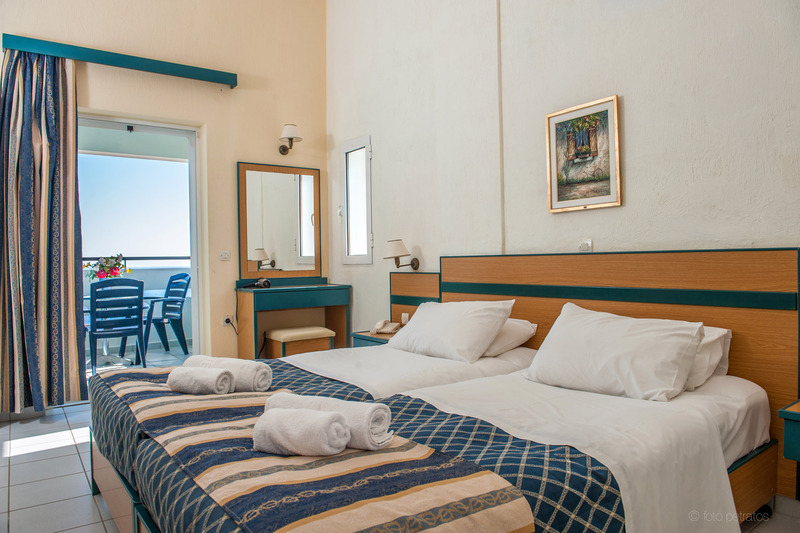 Combination of 2 double rooms with interconnection ability, Side Sea View, ideal for large families. Furnished Balcony with Side Sea View, Bathroom, Electric Kettle, Mini Fridge, Safety Deposit Box, Sat TV with radio stations, Telephone, Hairdryer.